In my never-ending quest for the perfect product, I again stopped by a place near my job called Pure Beauty. They sell sample sizes of expensive products so that you can try them, and then hopefully fall in love and come back. Yesterday, I combed the web and found myself interested in Johnathan|product and Joico K-PAK Deep-Penetrating Reconstructor. I found both! The Johnathan products were actually being phased out so what was left was 75% off! I scored the Green Routine Silkening Cream for $6 and the Joico samples for $4. I was still rocking a 3 day old twist out last night, so when I got home I simply applied some of the reconstructor to my dry ends, tied it up and went to bed. This morning, I washed my hair with a Neem shampoo ball I have (I'll have to look up that vendor-from Eastern Market) . I separated into 4 sections and used the rest of the bottle of reconstructor. As I used my fingers to work through each section and detagle, I IMMEDIATELY noticed a change in the way my hair felt. It was more substantial, coated almost, like fibers. It was dope. Not easy to detangle, but pretty resilient feeling. I applied some of the hydrator over the reconstructor and managed to get through all my hair and then let it set in the 4 braids while I showered. When I rinsed my hair it was feeling totally divine! Alas I was out of time. 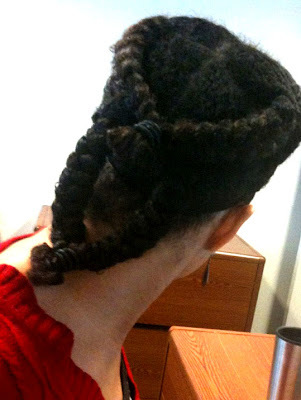 I rinsed and re-braided each section and had no time to style my hair. I undid each braid after a towel blotting, ran the marvelous smelling Johnathan Silkening cream through (a creamy, rich, almost oily, minty balm), rebraided a bit more neatly and then ecostylered (verb- meaning to smooth frizzyness with ecostyler gel) the edges and slapped two bands on the front of my wet hair for this style below. But I can't wait to get home and play with my hair. Not sure what I will do with it yet. Maybe a roller set. I'll have verdicts on the products and their full price worthiness with my full results. Hi! I just happened to stumble upon your blog today, and not even quite sure how I got here, but I ABSOLUTELY love it! Your hair texture is sooooo similiar to mine! I just quickly scoured the blog from top to bottom, but don't think that I saw what your total hair care regimen is. Can you provide a brief summary of what it is, and what products you are currently using? Thanks you! thanks for the nudge. I have to compile a regimen. I still change it a lot. but some things stay the same.